Clear span metal buildings and steel garages. 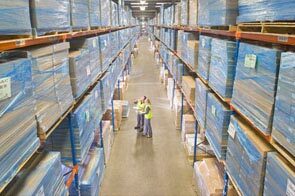 The term clear span refers to the area inside the building 100% clear of any structural obstruction. 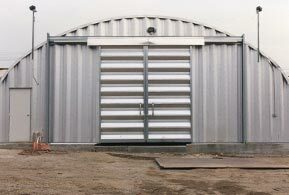 Buy your clear span steel building at Metal Building Kings®. 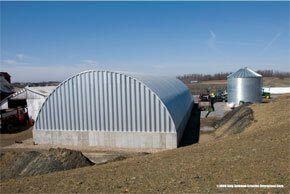 The span of a metal building kit between the arched walls is unsupported by vertical beams. In other words the inside is clear of any interior support beams, rafters or trusses which is described by the term “clear Span”. 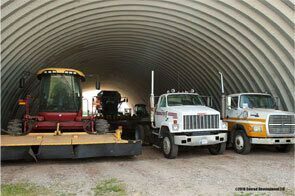 Because of the 80,000ksi tensile yield carbon steel corrugated engineering in steel arches, the strength of the sections that are bolted together requires no internal support poles, pillars or beams. 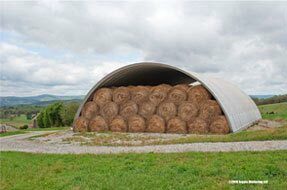 The steel arch panels have a 7½" deep corrugation and are engineered for maximum strength. 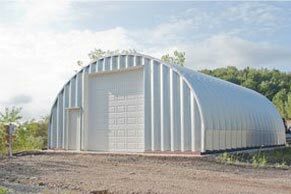 Pre-engineered clear span steel building kits are easily put together and when fully constructed provide a solid structure impervious to hurricane winds and fierce conditions. The clear span design on all garage kit models is also more structurally sound than a wood framed building with support beams. 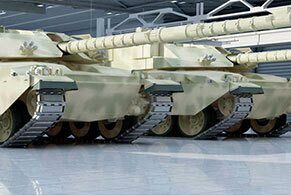 The pre-engineered metal building system is designed with 4 different side walls to provide different interiors from straight vertical walls to arched walls. Each gives the buyer a selection to choose from depending on the purpose of the clear span inside. 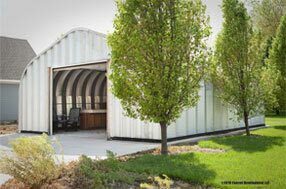 The prefab metal garage is easily constructed and provides strong support with steel that comes in 14 - 22 gauge corrugated panels strong enough to be certified by government requirements and up to 170 MPH winds. What is unique about the arch clear span design is the building is stronger than any other without the need for beams and framing which costs more that the arch clear span building. The clear span gives you unimpeded access throughout the interior of the building allowing you to utilize 100% of the interior space. The clear span design allows you to design the interior for practical purposes any way you want to. Free roaming access for vehicles to travel throughout the building is a desirable feature to this design. 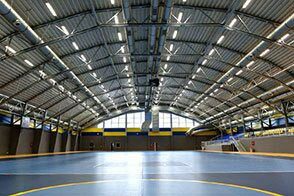 Arenas that require a sports court for basketball, hockey or other venues use clear span building kits. 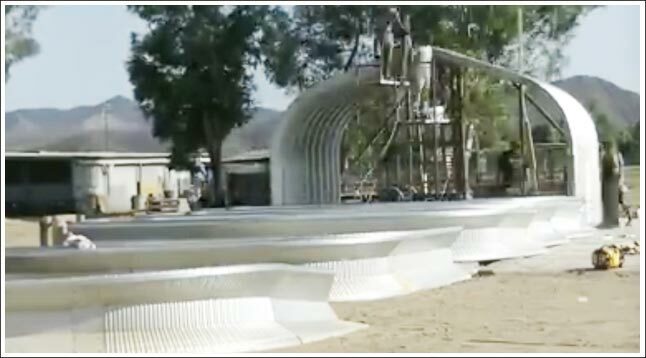 Prefabricated metal buildings with traditional straight walls and roofs require support beams unlike the arched style building kits. 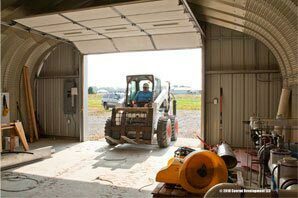 The size of clear span buildings can range from up to 150 feet wide and 40 feet all at the roof pitch and virtually as long as you need. 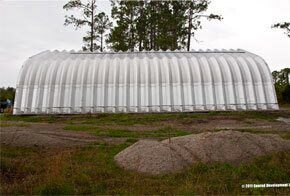 There are several types of clear span arched metal building styles unique to them being the roof and wall styles. The A Model has slightly slanted walls and roof pitch designed to be the most structurally sound. The Q Model is a half circle style often used for agriculture. The P Model (“P” standing for peaked roof) has vertical side walls and a slanted pitched roof. And the S Model clear span building is like the Q Model but with partially vertical walls. 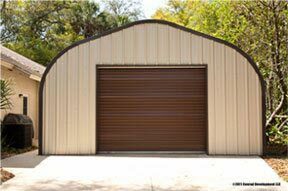 Metal building codes for your local area include specifications for clear span building kits so there is never a building permit issue for any location in the United States.